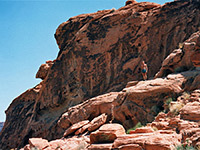 This website describes the spectacular and amazingly varied landscapes of the American Southwest. 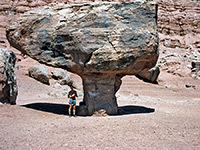 All the information is based entirely on my own travels in Southwest USA, and all the photographs were taken during these times. The pages are meant to describe and illustrate the scenery of the national parks and monuments, and the land in general; places to visit, where to camp (free of charge! 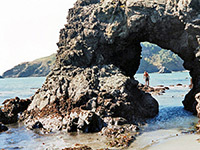 ), interesting hikes, scenic drives and viewpoints. More mundane aspects such as park rules and regulations, opening times, and visitor services in local towns are available elsewhere, such as at the main NPS site (www.nps.gov). The main page for each location includes a link to the official website, where applicable (the 'Management' link). I have spent a total of 24 months and driven well over 100,000 miles touring the Southwest in a rented recreational vehicle (RV), since 1993 and continue to do so several times every year. Generally, I prefer natural scenery to cities although I have visited all the major towns in the Southwest. 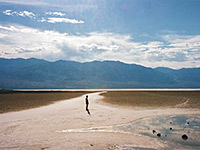 I rent a small RV so that I can reach remote places on rough tracks, as well as visiting the more popular attractions. I have also driven across Texas to Florida, and been as far north as Oregon, Idaho and Wyoming, but most of my journeys have been around California, Nevada, Arizona, Utah, New Mexico and Colorado. I think the best part about RV travel is the freedom it offers and the ability it gives to visit and stay overnight at (almost) any place in the countryside - it is often possible to park in spectacularly beautiful locations with nobody else for miles around. This site will be continually expanded, to cover more attractions, to include additional details for the current locations, and to add enhanced photography, videos and panoramas. The focus will be increasingly towards more remote places; hiking trails, narrow canyons and mountains. 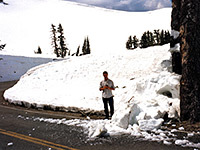 The series of guides includes California, Colorado, south Idaho, south Oregon, central/west Texas and west Wyoming, in keeping with a broad geographical definition of the Southwest rather than just the conventional area comprising Arizona, Nevada, Utah and New Mexico.